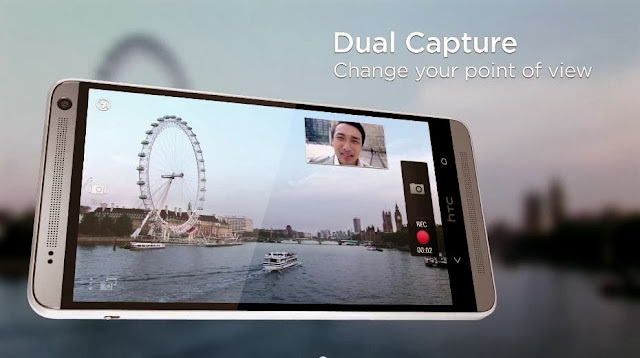 Petrasite:: HTC One Max : Boom(sound) to the Max! The HTC One is arguably of one the most speculated and some would say, anticipated mobile devices this quarter as it marks the Taiwanese firms’ first foray into the phablet market with the 5.9” screened device with commenters viewing it as a competitor to the likes of Samsung’s Galaxy Note 3, and Sony’s Xperia Z Ultra, among others. The One Max bears many similarities to its smaller sibling, the HTC One, touting an impressive array of features which include BoomSound, the Ultrapixel camera, full unibody aluminum casing, HTC Zoe + video highlights, an IR blaster and Blinkfeed. The standout features besides the 5.9” 1080p SuperLCD3 screen are of course the fingerprint scanner on the back of the device, a 3300mAh non-removable Lithium Polymer battery and microSD card slot (accessed by removing the aluminium back). The three pogo pins on the back of the device are meant to be used by accessories like the Power Flip case for the One Max (more on that later). Another change in layout from the One is the Max's power button has been shifted to the right side of the device under the volume rocker, while the left side contains the release switch for the removable rear cover to allow access to the micro sim tray & microSD card slot. Astute observers will note that the Beats Audio branding is conspicuously absent from the One Max’s photos, and it is indeed not a feature on this device. Though it is my understanding that despite recent corporate re-alignments aside, HTC’s partnership with Beats Audio remains for the foreseeable future and it will continue to be offered on selected HTC devices in time to come. Some early feedback seems to suggest that the larger speakers on this device actually produces better sound amplitude due to the physically larger speakers. Also absent is the Optical Image Stabilisation (OIS) on the ultrapixel camera, which for unknown reasons (to keep costs down, perhaps?) was excluded on the Max. While the One Max will come in 16 Gb & 32 Gb variants, the international markets will get the 16Gb version. Though the One Max sports a similar S600 1.7Ghz quad core processor and 2 Gb RAM like on the One, which on paper seems inferior to competing products, the One Max offers the same smooth, lag-free experience as the One does on Sense 5. 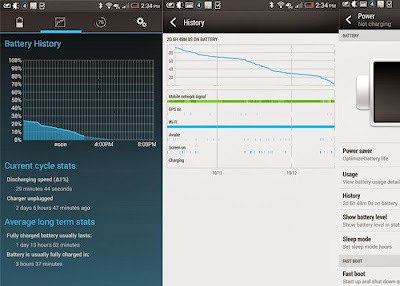 It could also be said that with the update to Android 4.3, the superior software optimization means that the One Max is able to run as good (if not better) than the competition as it does not need the S800 processor or additional RAM. In fact, the paring of the S600 and the battery, according to an internal tester (who shall remain unnamed), does produce a very respectable battery life as the large battery in the One Max really seems to live up to its “Max” moniker in that under regular usage with Wi-Fi, Bluetooth and GPS on during the day, it had lasted nearly 55 hours in between charges, and this was while it wasn't running on power saver mode either. Rather impressive stats and what makes things even more interesting is the One Max’s power flip case (on the right) which has an in-built 1210mAh battery which is used to charge the One Max without adding much heft to the 10.29mm thick device. The fingerprint scanner, which would be the most obvious addition to the Max, is used not only to unlock the device, but also to fire up apps, where a user can program the swiping (Up or down) of 2-3 different fingers to launch up to 3 different apps. NFC, Bluetooth 4.0, Wifi N, LTE support as well as the usual array of sensors come as standard as expected from a device belonging to the One family. DLNA support is also present as is MHL via the micro USB port connector. • Dual capture mode in the camera app – a Picture in picture mode which utilizes both rear and front facing cameras in one shot for the traveler who need to take scenic selfies. • Blinkfeed - Allows for Google+ feed & composing, RSS feed support, a ‘Read later’ mode and a menu interface that appears when you swipe right on blinkfeed. There is also the option to turn off blinkfeed entirely from permanently occupying a panel. 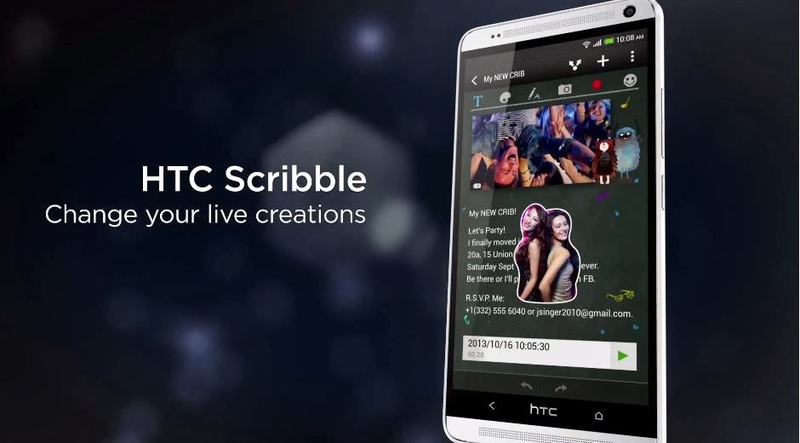 • HTC Scribble – seems to be an added functionality for making notes, lists, making cards, sharing photos and so on, with a number of customisable templates included which can be saved to Google Drive or saves a image files. • Video highlights – Users will get to choose to add audio files on their devices as the soundtrack and tweak the length of highlight clips with 12 themes to choose from. These are just some of the improvements coming with Sense 5.5 in addition to greater customization of the quick settings pull-down grid. 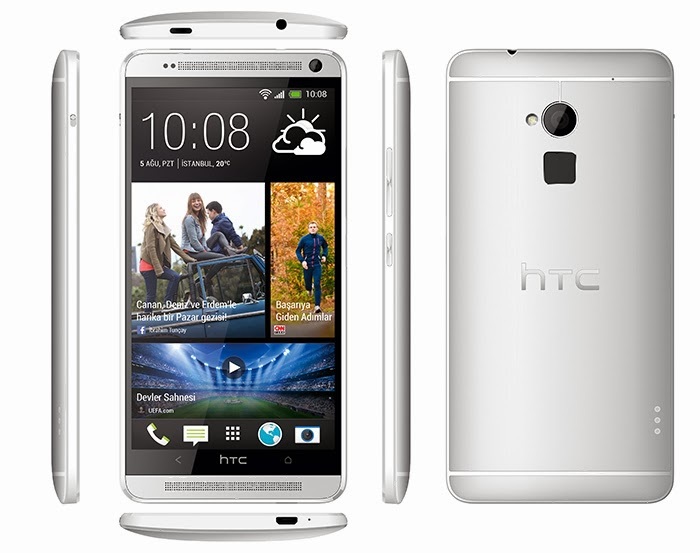 In short, The HTC One Max is in some ways, a much larger HTC One, while maintaining the pedigree of its predecessor, also tries to differentiate itself with features like the fingerprint scanner, larger screen and functionality, while stretching to become HTC’s hopeful answer to the likes of the Galaxy Note 3, and Xperia Ultra. Only time will tell, if the One Max will go on to build on the success story of the One & One mini that came before it.